You might overlook it but a dining room table is an important part of your home as well as the living space. Acting as more than just a space to have meals, dining table is a point and place where your guests end up spending a lot of their time and it definitely plays an important part in every holiday event, you host. Considering it is an important piece of furniture in every home, we have today compiled a set of 10 designs that will serve you with the best and creative inspiration. This industrial style dining room range comes with a dining bench, dining chairs and table. 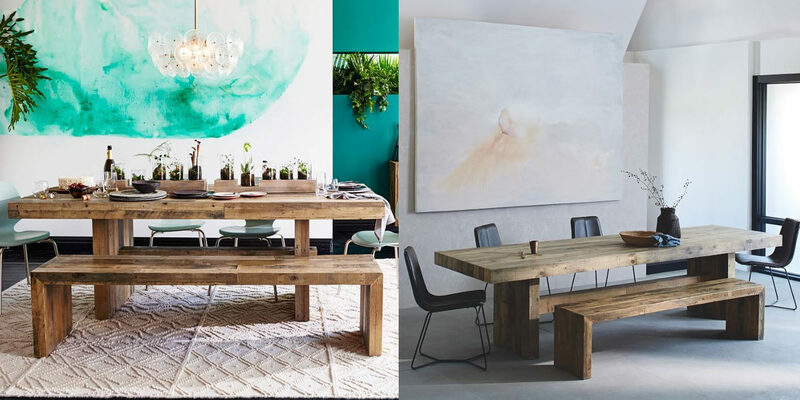 Made from reclaimed Indian wood and steel frame, the dining table and chairs can help in bringing a rusty and contemporary upgrade to your space. Taking inspiration the early 20th-century work table, the Benchwright extending dining table provides a backdrop for creative entertaining. The natural grooves and saw marks on the wood create the look of reclaimed wood and the oversized bolts on the legs and tabletop add to a rustic value of the table. Made from unfinished reclaimed pine, the Emmerson reclaimed wood dining table reflects the pure blend of rustic and relaxed. The table exhibits the natural imperfections and knots making each piece subtle and one of a kind. 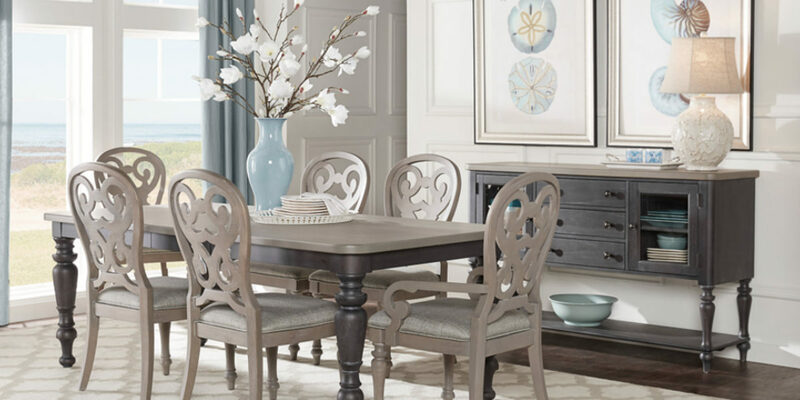 Sophisticated and casual, the coastal breeze dining room renders a perfect balance for the today’s home. Crafted with wood solids and Mindi veneers in a two-tone wire brushed charcoal and light grey finish. The table features round edges and the classic spindle legs. 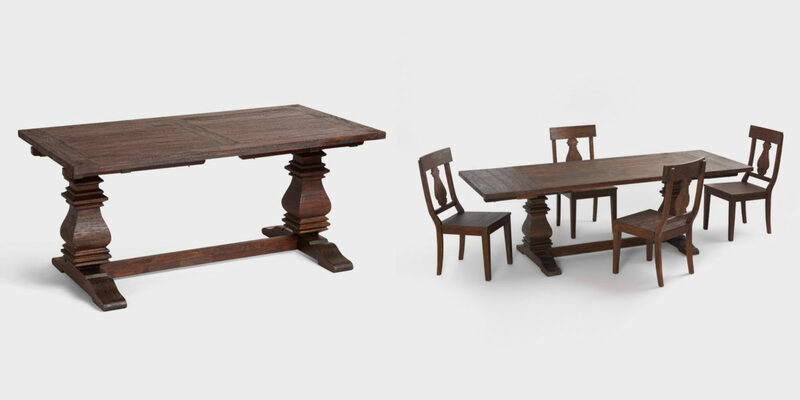 Rather an unusual choice for a dining table, but if you have a small family this antique looking table can work well as a kitchen work table as well as a counter-height dining. 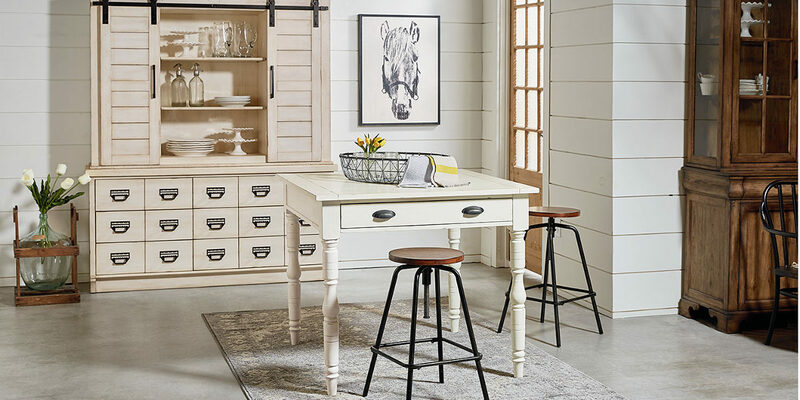 The distressed finish of the table can instantly add a timeless charm to the look of the home. 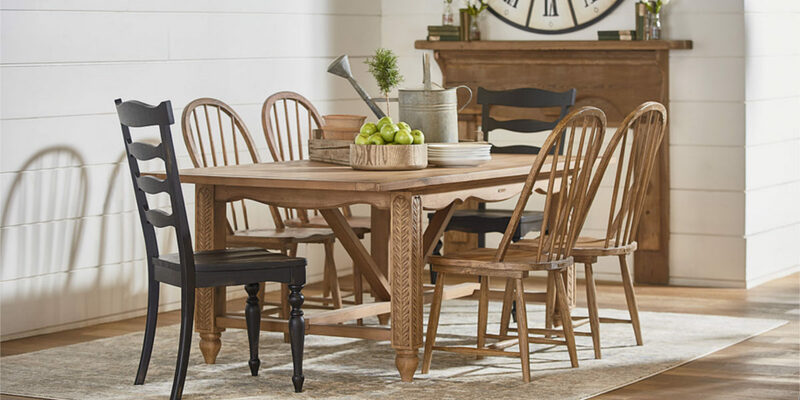 Rustic yet sophisticated, this well-crafted dining room table features a natural brown finish that is well accentuated with mixed hardwoods. 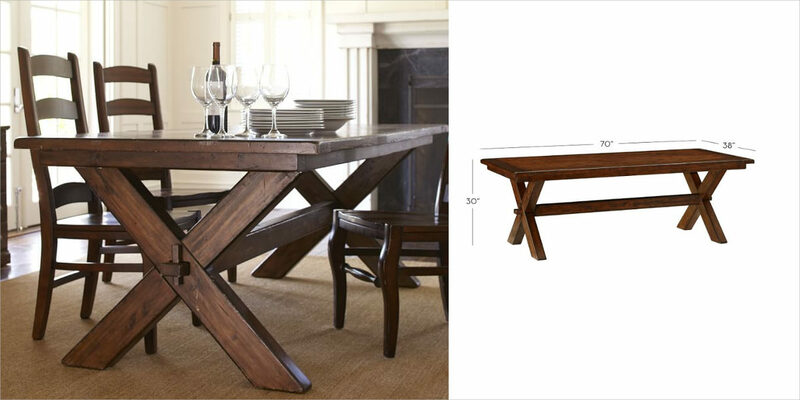 The expertly carved legs lend a touch of elegance and sturdy built to the table. Minimally designed, this Anezi dining table expresses sophistication with an edge. 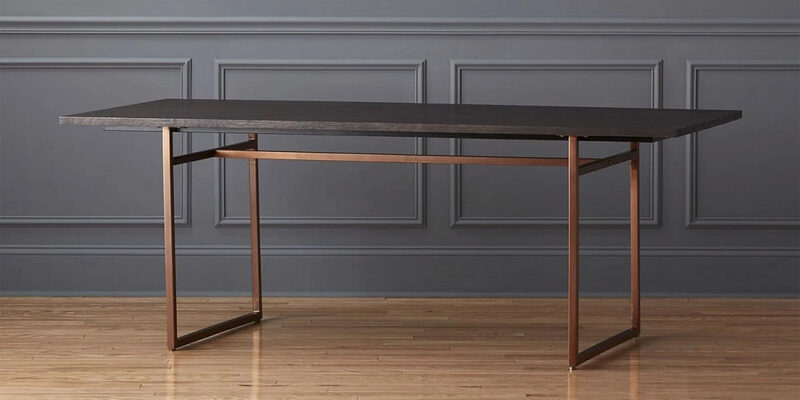 The minimalist luxe copper base features a contrasting slab of dark mango wood in a mixed hue with wood grain and natural markings. The table is a perfect blend of current trends and traditional. 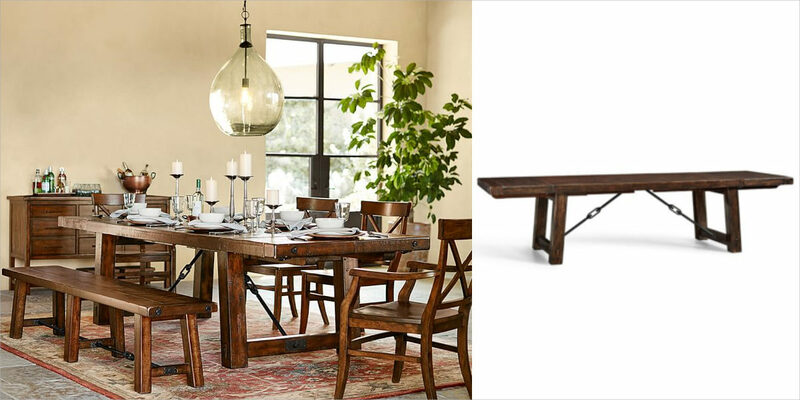 Sporting an X-shaped support and keyed through tenons, the table is crafted with a distressed plank top and softened edges. The design enables the sitter to enjoy plenty of legroom. French inspired leaf carved dining table features a curvy apron and leaf carved leg posts. The carving and the laid-back toffee coloured finish makes the design one of a kind and perfect if you are looking for something detailed yet artistic. 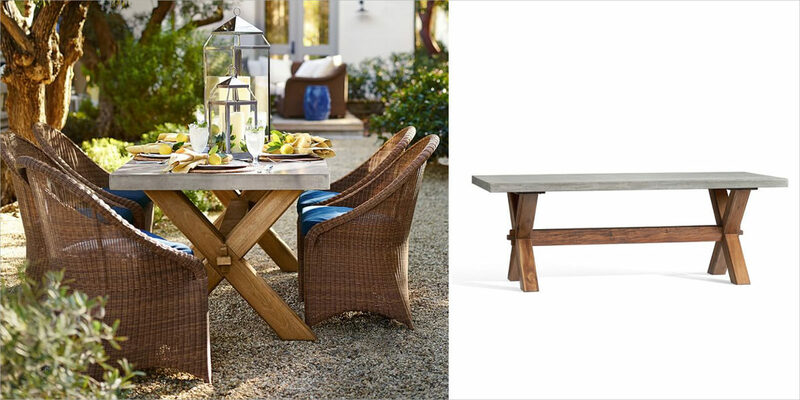 The rugged and casual look of the concrete top is paired with hand-finished reclaimed acacia making it a perfect piece to support your outdoor dining rendezvous. The X-shaped bottom support provides a casual base which will duly complement any style of seating. Pick the best suited and upgrade your space with a touch of comfort and luxury.